Place potatoes in microwave-safe dish. Cover and microwave on HIGH 2-1/2 to 3 minutes or until crisp-tender. Let stand 5 minutes to cool slightly. Thread potato halves onto 10 to 12-inch metal skewers. Thread onion halves onto separate metal skewers. Combine rub ingredients; reserve 2 teaspoons for garnish. Press remaining herb mixture evenly onto beef steaks. 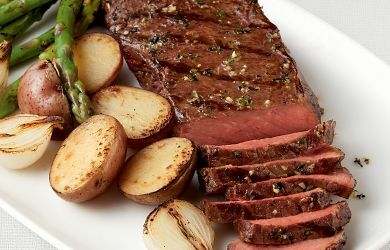 Place steaks in center of grill over medium, ash-covered coals; arrange potatoes, onions and asparagus around steaks. Grill steaks, uncovered, 15 to 18 minutes (over medium heat on preheated gas grill, covered, 11 to 15 minutes) for medium rare (145°F) to medium (160°F) doneness, turning occasionally. Grill potatoes and onions 5 to 10 minutes (gas grill times remain the same) or until golden brown and tender; grill asparagus 6 to 10 minutes (covered, 8 to 12 minutes on gas grill) or until crisp-tender, turning occasionally.